A favorite gathering place for our Baylor family, the Bill and Eva Williams Bear Habitat is home to our live mascots and is located in the heart of the Baylor campus. Engraved bricks line the walkway around the habitat, which is located at the intersection of Fifth Street and ML Daniel Esplanade. Engraved bricks are available. Serving as the main entrance to Baylor Ballpark, the Getterman Softball Complex, the Hurd Tennis Center and the Betty Lou Mays Soccer Field, the Schroeder Athletic Plaza is an ideal spot for Baylor fans to show their pride and their support. Engraved bricks are available. Located in the heart of campus, the Ed Crenshaw Student Foundation Building is dedicated to promoting Student Foundation’s mission of serving Baylor through scholarship fundraising, student recruitment and community building. Lining the sidewalk outside this building, which is located on South Fifth Street between Speight Avenue and Bagby Avenue, are the names of former Student Foundation members and those in the Baylor family who support them. Engraved bricks and granite pavers are available. Show your Baylor pride where the Bears play! The Lt. Jack Whetsel Basketball Practice Facility is attached to the Ferrell Center, on the corner of South University Parks Drive and LaSalle Avenue. 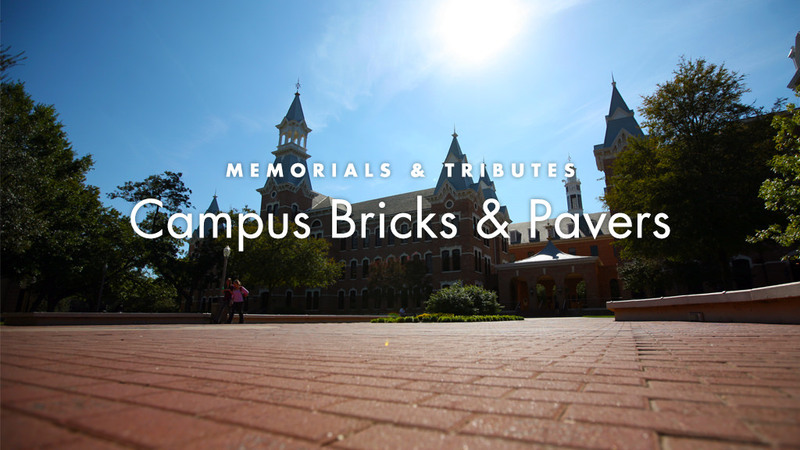 The bricks are located on the exterior walkway connecting the Practice Facility’s entrance to the entrance of the Ferrell Center. Engraved bricks and granite pavers are available. In 1995, Baylor University commemorated the 150th anniversary of the institution’s establishment. To celebrate this incredible milestone, the Sesquicentennial Walkway was established in order to give alumni, parents and friends an opportunity to etch their names into the history of this beloved university. Since then, the walkway has come to be a physical representation of That Good Old Baylor Line. The Walkway is located in the Burleson Quadrangle in the heart of the oldest part of campus. Engraved bricks are available.